What are the different options with catgut sutures and which is the best use for each option? New technology has allowed catgut sutures to become more specialized. Different companies provide different options in catgut sutures that can be used in specialized or general types of surgical procedures. Natural or plain catgut is the traditional option for catgut. It is fully absorbable by the body and comes in a moist suture that is sterilized, needled or on a ligating roll that is not needled. 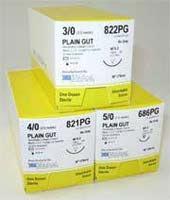 Chromic gut is similar to natural catgut sutures except the suture has been treated with a chromic salt solution that helps to reduce the rate of degradation or absorption of the product by the body and maintain a more uniform tensile strength for wound healing over longer periods of time. Unlike natural catgut chromic gut has a more standardized rate of absorption and there are few factors that can influence this variable. There is still a minimal reaction of the surrounding tissue to the chromic catgut sutures, making it a good option for many different types of surgical procedures. Fast absorbing catgut suture are available through some manufacturers. These sutures are designed to be begin to lose tensile strength within a very short time, typically 7 to 10 days after the wound ligation. How generalized or specialized is the use of catgut sutures in a variety of different medical treatments? Catgut has historically been used as the major suture product in all types of surgical applications. Newer options for sutures have provided greater options for specialization, even within natural catgut options. Chromic gut is often recommended for very sensitive areas of the body including dental surgery and ophthalmic surgeries. It can also be used in plastic surgery since it is naturally absorbing and does not require stitch removal. Traditional natural catgut, also known as plain gut, can be used in the same types of procedures as well as in general soft tissue ligation and approximation. It is also commonly used in dental surgery and in veterinary surgery, again with the absorption rather than removal of stitches providing a huge benefit to patients and animals. As there are several factors that can speed up the dissolution of the catgut this type of suture is not recommended in high stress levels of the body such as cardiovascular procedures where long term wound support is essential. Catgut is also not commonly used in neurological procedures. Are there factors that need to be considered regarding the absorption of catgut sutures in the body? Catgut, particularly plain gut, has a general range of absorption time by the body that will vary based on the diameter of the suture. Catgut typically is fully absorbed by the body within 90 days but the actual tensile strength of the suture can begin to decline within one to two weeks, depending on the specific type of catgut used. Catgut sutures are broken down by the body similar to the breakdown of proteins which occurs through naturally occurring proteolytic enzymes. Some individuals may have a faster breakdown rate than others, which is not possible to detect prior to the sutures being in place. Other factors that can influence breakdown are wound cleaning products, particularly hydrogen peroxide, and the presence of infection which can speed up the breakdown of the catgut as well.